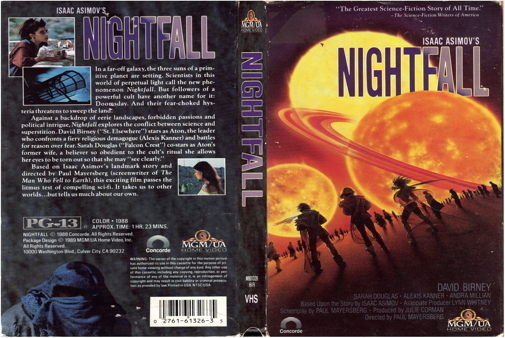 This sci-fi drama is based upon a classic story by Isaac Asimov. It is set upon a planet located in a solar system with three suns. The trouble begins when both a seer and an astronomer predict a once-per-millenium solar eclipse and the prediction comes true. Never having seen darkness, the people are terrified and in trying to cope, a great social schism occurs. Half the population begins believing that the eclipse heralds the demise of their civilization and live accordingly, while the other more optimistic half simply head underground to await the dawning of a brand new day.